As part of its Japan focus the 1999 Biennial Festival for New Music in Hannover also presented Toshio Hosokawa's exploration into the music of his "musical ancestors." This CD was recorded live during the performance and includes three works from the 17th and 19th centuries. Chidori no kyoku by Yoshizawa kengyô II (1808-1872) is based on the 31-syllable poems of the classical poetry anthology Kokin wakashû (10th century), so-called waka poems; chidori is the Japanese plover, whose calls have been musically preserved for posterity here. Hachidan no shirabe, attributed to the blind koto virtuoso Yatsuhashi kengyô (1614-1685), is a sort of eight-part series of variations; the composition was passed on orally to other blind koto players and noted down only in the 18th century. Nasuno by Yamada kengyô (1757-1817) was composed around 1800 and is based on Japanese mythology. 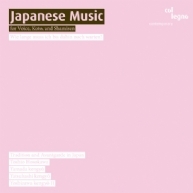 And in Nocturne and Banka Toshio Hosokawa uses a larger koto, the jùshichigen; in these pieces as well as in Koto-uta the composer, while working on the logical continuation of Japanese music culture, endeavors first and foremost "to make the innermost part of the human heart stir passionately." Musica Viva 02: Space and sound, modernism and pluralism, "perfect harmony" and, finally, the fascination of collectively organized fireflies.